FRESH CROP. 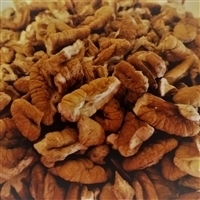 Pecan pieces are separated in the plant into this uniform size which is perfect for pecan pies or other recipes straight from the bag. Packaged in 1 lb bags. FRESH CROP. Small pecan pieces are ideal for using in your cookie or candy recipes. Packaged in 1 lb bags.